As a small business owner (aka full-time traveling yoga teacher), I’m often asked “How are you able to take vacation?” Or sometimes it sounds like “Won’t your office yoga /corporate yoga clients find another instructor?” and “Aren’t you worried your private yoga clients will be upset?” A huge part of the Business of Yoga is taking care of you! Honestly, I’m always baffled by these types of question Part of a yoga teacher’s job is to help people feel better. Better is a simple term for a world of sensations such as healthy, grounded, energized, empowered, confident, calmer, refreshed, stronger, etc. In order for me to give my yoga clients what they need, it’s important I give to myself which means I do more than eat healthy and get on my mat. Giving to myself is key as a “giver to others” and it includes taking vacations and periodic personal days. Most of us would agree…rest is underrated! In our GO, GO, GO society -especially in a city like Washington DC – too many people don’t take rest until they are forced to do so. It often takes being run down with the flu, having a panic attack or some other serious condition that requires a hospital visit to halt a fast paced life. Visualize being a marathon runner or weight lifting competitor. They train hard but they also know how crucial “rest” days are for the body. As a full-time yoga teacher I have a weekly schedule of teaching clients as well as a schedule of my personal practices and gym days. Literally, I put them on the calendar so they’ll happen. I also put my vacations on the calendar and let my clients know well in advance when I’ll be taking a break. Many of them even appreciate that I take time for me! 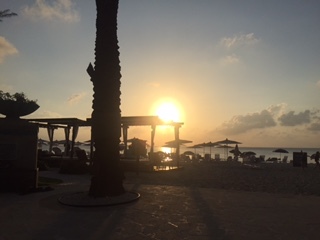 Still dreaming of Grand Cayman (Nov 2015). Can’t wait to go back! Whether you manage a yoga studio, teach yoga full-time or have a corporate job that consumes your life, you need to take a break and unplug! Unplugging (no cell, email, facebook, fa cetime, etc.) is another blog post. The point is it’s important to carve in some downtime periodically so you can show up and be your best regardless of your profession or passion. It’s really a win-win: you’ll feel better and your clients will appreciate your fresh energy. More than likely, they’ll be happy you took some time to take care of yourself! Melody of abellaYoga has been gratefully teaching yoga full-time in Washington, DC, Alexandria and Arlington, VA since 2006. 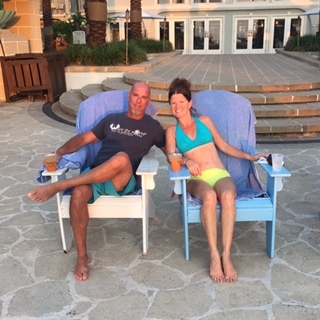 Thankful for experiences gained in the telecom/tech corporate world, this ex-marketing, yoga-chick is happy to share all she knows about yoga with all. She also teaches the Business of Yoga as part of local teacher training programs in the DC area. If you’re a new yoga teacher, contact Melody to learn about her Biz of Yoga coaching program.